On February 20th, APPG Co Chair Alex Sobel MP led the first parliamentary debate on basketball in five years. The focus of the debate was to address the historic funding shortfal for Basketball's elite game. Despite the clear inclusivity and popularity of basketball it is among the least funded sports in the UK, having received less than half the amount of funding as hockey since 2009. Alex, and other MPs, pushed the Sports Minister to provide the funding necessary to support a variety of sports which offer great opportunities to people from all walks of life. A cross-party group of Parliamentarians has called for a “radical rethink” of how the sport of basketball is funded in the UK, arguing that the ability of basketball to transform the lives of young people warrants greater recognition from the Government. Following a series of evidence sessions held in Parliament in March and April, the All-Party Parliamentary Group (APPG) for Basketball has published its first report today (Thursday 17 July), which calls on the Government’s sport funding bodies – UK Sport (elite level) and Sport England (grassroots development) – to change their decision-making processes to take account of the wider, social value of inclusive team sports such as basketball. Evidence to the Inquiry panel – including from Brixton Topcats, where NBA star Luol Deng first played - showed the significant and unique impact that basketball community outreach programmes are having in some of Britain’s most deprived areas, by not only giving young people aspiration but also addressing common challenges faced by disadvantaged young people, including poor health and educational outcomes. However, the members lamented that this work goes unrecognised and unrewarded by Government and its sporting agencies. In particular, the Parliamentarians condemned the fact that elite level funding for basketball was withdrawn altogether by UK Sport earlier this year, threatening the ability of Team GB teams to compete in international competitions like the FIBA Eurobasket Championships which Team GB’s women’s squad qualified for at the end of June, and therefore reducing the visibility of basketball role models to inspire young people to participate. Combined with the historically low levels of funding for grassroots basketball programmes by Sport England compared to other sports, the report warns that basketball will continue to fail to live up to its potential, and inner city youngsters will lack role models in a sport they play, unless funding decision-making processes and success measures are updated. - Against the current backdrop of under-investment, basketball’s governing organisations themselves need to be creative in developing plans both to increase the exposure of young people to basketball through social media, and in ensuring community facilities are available. A host of MP’s have been learning more about the sport alongside BBL and WBBL stars at the second ‘Shoot Some Hoops’ event which was held by the All-Party Parliamentary Group (APPG) for Basketball. On a court set up outside the Houses of Parliament and after a busy session of PMQ’s (Prime Minister’s Questions), MP’s were put through their paces by the likes of Tayo Ogedengbe and Will Neighbour of Surrey Scorchers and Barry Lamble of Leicester Riders. There was also representation from Great Britain and the WBBL in the shape of Erin McGarrachan (Leicester Riders) and the legendary Stef Collins (Cardiff Met Archers) who has won a stunning 125 caps for her country. GB wheelchair players who scooped a glorious gold (men) and terrific bronze (women) at the European Championships in Worcester earlier this month, were also present. It wasn’t only players and MPs either, since a range of partners from across the British basketball community participated - including the Basketball Foundation. Even though it was pouring with rain, it still didn’t dampen the enthusiasm of MP’s who had their respective ball-skills checked. They also heard about the All-Party Parliamentary Group (APPG) for Basketball’s inquiry report into the positive social impact of basketball within inner cities and deprived communities. The return of the ‘Shoot Some Hoops’ event, coincides with the Sport Minister, Tracey Crouch’s sports strategy consultation which will run until Friday 02 October 2015 after an overall decline in weekly sport participation in the Active People Survey - despite the positive news that basketball was the fastest-growing sport in the period reported. “It was great to host the second ‘Shoot Some Hoops’ showcase in Parliament after the success of last year and to see so many MPs come out to show their support for basketball,” enthused Sharon Hodgson MP, Labour Member of Parliament for Washington and Sunderland West and Chair of the All-Party Parliamentary Group for Basketball. "It is important that politicians hear about the important work basketball clubs are doing right across the country to inspire young people to become more active and lead better lives and what they, as policy-makers, can do to help overlooked sports such as basketball. "That is why I hope the current new sport’s strategy consultation by the Department for Culture, Media and Sport will give the likes of basketball the opportunity to show how they are able to tap into the potential of young people to help them succeed in life." Her continual support for the game in leading the APPG for Basketball certainly impressed Ogedengbe. “It’s amazing having an event like this and I’m glad we have got someone like MP Sharon Hodgson on our side,” he reiterated. “As Chair of the APPG, she is able to be our voice and is easily accessible to help with any issues. “It’s a good chance to show people what the sport is about and things like this are important to raise the profile of basketball. His Scorchers’ colleague Neighbour added, “It’s massive to be able to show basketball to people at the top and then seeing them show such an interest in our sport. “It was a great experience to be at the Houses of Parliament and meeting important people who can potentially help. “We need to keep developing the interest of the sport and get people watching games, so that the sport can continue to grow in this country. Finally, EuroBasket Women 2015 participant McGarrachan commented, "By raising the profile and increasing the awareness of basketball, it will hopefully help even more people to get involved in the sport. "It’s the little things that help along with these kind of events and they can help get basketball further to the front of people’s minds. Westfield Health Sheffield Hatters coach Vanessa Ellis described WBBL Play-off Final success as ‘the cherry on top of the cake’ of a fantastic season. 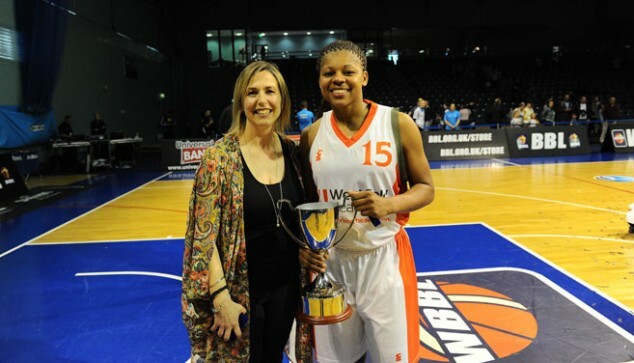 The WBBL Coach of the Year led her team to a clean sweep of silverware in the league’s inaugural year with an 84-69 triumph against Nottingham Wildcats on Sunday. Hatters had already beaten the Nottingham club in January’s WBBL Trophy Final and emerged victorious from their WBBL Championship final-day decider earlier in April. But the Ellis insisted it has not all been plain sailing for her all-conquering squad. “People don’t understand, but we have had a tough season,” said Ellis. “We haven't mentioned it but we have had a lot of injuries, we’ve had training sessions with only five players, we went to Northumbria without three starters and other people had to step up and that’s what we have done this year. “We have pulled together as a team and taken every challenge. Having led for most of the contest, Hatters trailed by two in the closing stages of the third quarter before quick baskets either side of the break allowed Ellis’ side to regain control. “We knew what we had to do and that was play our game,” added the Hatters coach. “We got a bit distracted from it when they got close, but we talked about being us and playing our game and that took us away in that final break. League MVP Steph Gandy has hogged the headlines this season, but it was Helen Naylor who was crowned MVP in Worcester after driving her team on with a 30-point performance. Ellis was delighted to see Naylor return to her best, and felt it typified her team’s ability to find someone to step up. “She’s been struggling the last couple of weeks,” said Ellis of her MVP. “She had an operation to have her wisdom teeth taken out and not really got back, but I thought today she was back to top form. Great Britain Senior Women's legend Stef Collins has been showing her support for the All-Part Parliamentary Group (APPG) on Basketball by attending an event at the Houses of Parliament. The point guard, who has who has won an incredible 125 caps for her country and also represents Cardiff Met Archers in the WBBL (Women's British Basketball League), underlined the importance of the event to raise awareness of the sport and how it can make a positive impact on social challenges. "To inspire the next generation of players and to ensure the future of basketball is strong requires a collective effort," stressed Collins. "Basketball is one of the most widely played sports in our country and so many young people out there have huge potential which we don't want to see go to waste. "I hope that decision makers will recognise that they need to be given an opportunity to shine - not least the thousands of people who play in our inner-cities and urban areas. "That is why I am here with the politicians from the All-Party Parliamentary Group for Basketball. "Their backing for the sport is vital and appreciated by us all." She continued, "Myself and the players try to do the best we can on the basketball court, but as athletes and for those players who want to follow in our footsteps, support is needed off the court to." The Speakers' Green event also gave MPs, Peers and their staff an opportunity to find out more about the sport, its accessibility and popularity. Representatives were there from all parts of the British game, including able-bodied and wheelchair players, administrators, the governing bodies and the media. Collins was joined by her EuroBasket Women 2015 colleague Erin McGarrachan, who will also play in the WBBL this year. "It's very important to keep raising the profile of basketball," said the Leicester Riders' player. "By raising the profile and increasing the awareness of basketball, it will hopefully help even more people to get involved in the sport." Meanwhile the Chair of the APPG on Basketball, Sharon Hodgson MP added, "It's great to be able to hold an event like this today and raise awareness of basketball. "We are really trying to keep pushing the profile of the sport in this country. "Some of the MPs present have probably never held a basketball before or had the chance to shoot a hoop, so it all helps to create an interest and hopefully more people will want to get involved." 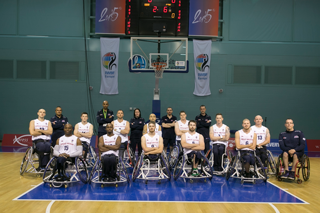 In a thrilling European Championship Final GB Men wheelchair basketball team retained their European Championships title beating Turkey convincingly, 87 – 66. The GB men were defending their European title for the third consecutive time against a tough and physical Turkish side, looking to avenge their defeat from two years ago in Frankfurt. It was a close opening quarter but it was Great Britain’s outstanding defence that caused the Turk’s problems as they struggled to breakthrough and some precision shooting from GB ensured they finished the first quarter in control 21 - 13. The Turkish coach, Harman Yazicioglu, altered his tactics and the new line up kept the second quarter tight: losing it by just one point and keeping the deficit to just nine points at half time. However the strength and depth of the GB team proved too much for the Turks and GB had response for all the Turkish units. The shots weren’t dropping for Turkey, including their star player, Özgür Gürbulak, and by the end of the third GB held a comfortable lead of 19 points going into the final period. The fourth quarter saw Great Britain dominate the play at both ends of the court and, whilst GB Head Coach Haj Bhania rotated his bench, the GB Men continued to extend their lead with an incredible performance - defending their crown in front of a full packed arena! GB Men’s Head Coach, Haj Bhania said, “It’s absolutely fantastic to win the European Championships in such style. To come out and win with performance like that against a very strong Turkish team was outstanding. I have to give all the guys credit: they played with great spirit and determination when it mattered and it was a brilliant team effort. “Although we were slight favourites coming into the tournament, we had some tough losses early on but we’ve got better throughout the tournament and we learnt from those games. Winning the European Championships for the third consecutive time was never going to be easy and the boys had a lot of pressures on their shoulders coming into this tournament so to get the result has been amazing! “It’s been a brilliant tournament and a big thanks must go out to the event staff, volunteers, officials and all the supporters who have come along and really got behind the team! . GB’s MVP of the game, Terry Bywater said, “It’s an amazing feeling to win the title for the third time! Everyone is just absolutely over the moon – we knew it was going to be tough against Turkey as they are one of the best teams here but we just had a great, great performance tonight. “It’s was always going to take a hell of a team to go unbeaten in this tournament, as you’ve seen Turkey were unbeaten until today and so were Germany unbeaten until the semi-final, that’s how close European Basketball is but it all depends on the last game and we got it done. “We are a bunch of amazing guys that have got a ridiculous amount of fight, determination and passion and just never give up. We lost against Germany and Poland and we picked ourselves up to win a gold medal - that’s the type of team we are! As the world prepared to mark one year to go until the Rio 2016 Paralympic Games, the GB Women’s Team took to court for the final time at the 2015 European Wheelchair Basketball Championships, overcoming a gritty performance by France to defend their 2013 bronze medal with a 69-39 win. Held from the 28th August to the 6th September at the University of Worcester Arena, the European Wheelchair Basketball Championships forms part of UK Sport’s National Lottery funded #EveryRoadtoRio programme, which targets events that will support the nation’s athletes in their preparation and qualification for the Rio 2016 Olympic and Paralympic Games. The continent’s sole wheelchair basketball qualifying event for next year’s Games, the Championships has seen 19 teams from across 12 nations battle it out at the University of Worcester Arena: the top five men’s teams and top four women’s teams earning their 2016 Paralympic place. The GB Women’s Team earned both a place in Brazil and the European Championship semi finals with 4/6 wins in the group stage of the event: overcoming Turkey (76-23), France (79-37), Italy (69-10), and Spain (54-50) – losses to Germany (39-53) and the Netherlands (52-64). Finishing third in the pool, Great Britain therefore set up a semi final clash against the second placed team: Germany. A nailbiting battle ensued, but it was the Germany Women’s Team – the 2013 silver medallists – who just edged out a single point victory by 56-55; the Netherlands defeating France by 52-64 in the earlier semi final. A tense start to the bronze medal game saw the opening shots not fall for either teams; it was, however, Great Britain who were first on the scoreboard as Jordanna Bartlett broke through the pressure to sink a fantastic shot (2-0). France hit back to the level the game on 2-2, but – settling into the match – it was the GB Women who pushed to a 12-2 lead at the end of the opening 10 minutes. With the momentum on their side, the defending bronze medallists continued to drive forwards in the second quarter: the GB Women playing their way to a 21 point lead within the first five minutes (27-6). Indeed, France continued to battle hard, but a stunning quarter performance saw Great Britain outshoot their opponents by 27-11 to enter half time with a 39-13 advantage. Rallying together once more in the third quarter, the GB Women continued to dominate play at both ends of the court as they soared ahead by 59-21 with just 10 minutes left on the clock. The French Women’s Team continued to put up a gritty performance in the final quarter, but it was Great Britain who closed out a 69-39 victory and with it the nation’s fifth consecutive Women’s European Bronze Medal. Head Coach Miles Thompson said: “Our goal was to get to the final, so it’s disappointing to come in third. But this team, the athletes, are so strong in spirit and the way they approach all the hard work that I couldn’t be prouder and I couldn’t be more optimistic about Rio. To deliver the Championships, British Wheelchair Basketball (BWB) has also teamed up with key partner the University of Worcester with invaluable support from the Worcestershire County Council, Worcester City Council and Worcestershire Local Enterprise.